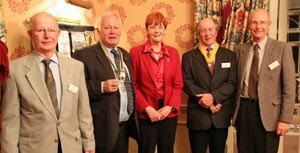 As part of her campaign to become Northumbria Police’s first elected Commissioner and to promote the election as a whole, Vera Baird revisited her old home town recently, and dropped in to speak to the Rotary Club of Amble and Warkworth, and The Ambler. The public were asked to vote on 15 November to decide who should take up the new Police and Crime Commissioner (PCC) roles. Although turnout was very low, with only 16.5% of Northumberland voting, Vera won the election with 56% of the overall vote. Vera lived in Amble in the mid 1980s before becoming MP for Redcar, and she was Solicitor General in the previous Labour government. “The job of PCC will entail consulting the public to find out what they want from their local police and put that into a five year plan. 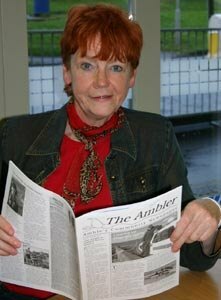 Every community should be consulted,” she told The Ambler. While campaigning, Vera Baird met (L to R) Rotarians Alan Richmond, Jim Barrett (Club President), Dr Paul Creighton (Senior Vice President) and Stephen Kerry (Secretary). Vera believes the new role is much more accountable as the Commissioner can be removed at the next election, which will generally be held once every four years at the same time as other local elections.